File Types: EPS,JPG,All Files; File Size: 800.91 KB; Requirements: Adobe CS1+; Vector: Yes. Stock exchange market bulls metaphor. 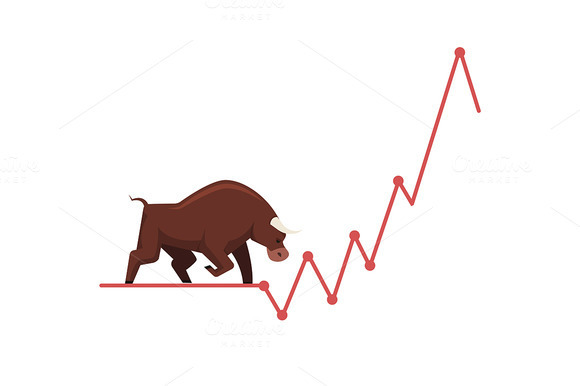 Growing, rising up stock price. Trading business concept. Modern fat style vector illustration. Keywords: flat, icon, vector, object, isolated, illustration, template, background, design, cartoon, metaphor, clipart, concept, character, investment, invest, trading, business, forex, graph, research, stock, market, shares, standing, balance, going, balancing, trade, money, smart, broker, stockbroker, trader, financial, finance, funds, assets, economy, corporate, horizontal, abstract, weight, banner, struggle, marketing, stockholder, layout, clearing, analytic, bargain, securities, scheme, bank, economic, system, wall, street, wallstreet, currency, brokerage, transactions, crisis, risk management, analytics, bull, stocks, sentiment, prediction, forecasting, trend, volatility, recover, forecast, trends, fight, fighting, battle, war, duel, push, urban, minimal, minimalistic, bulls, bullish, up, growth, long, gain, upgrowth, rise, rising, increase.